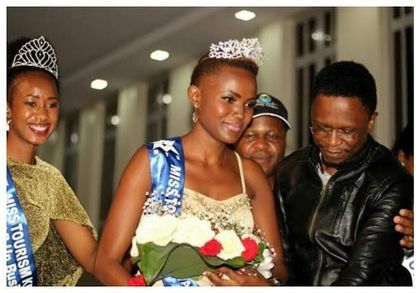 Monday April 15, 2019-Former Budalangi MP, Ababu Namwamba, has been on the receiving end after it emerged that he has dumped his heavily pregnant lover, Paula Ann, who is also the former Miss Tourism Busia County, and do not want to take responsibility for the pregnancy. However, Namwamba, who is also the Chief Administrative Secretary for Foreign Affairs Ministry, has rubbished the claims that he has abandoned his lover. Taking to his Facebook page on Monday, Namwamba said social media bloggers should find a life to live rather than following people's lifestyles. "This cyber Jungle is infested with Jungle pests wallowing in the miasma of miserable bile who really need to get a life," read his Facebook post in part. He added that he will never abandon the responsibility he has at any moment as he is a more responsible leader in the country. "Am happy and contented and I take all my responsibilities veeery seriously. I never abandon anyone I bear responsibility for," he added. Ababu took Paula after he bitterly separated with his wife, Priscah Mwaro, over infidelity. that's the lifestyle of a rat fucker.